Pentostatin(Deoxycoformycin) is a irreversible inhibitor of adenosine deaminase (Ki = 2.5 pM). Pentostatin (Deoxycoformycin) is useful for anticancer agent. Bamifylline is a selective A1 adenosine receptor antagonist. 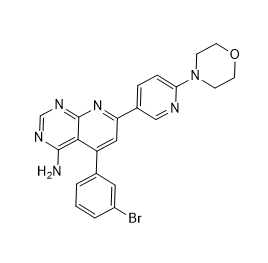 ABT 702 Dihydrochloride is a potent non-nucleoside adenosine kinase inhibitor, selective over other sites of adenosine interaction like A1, A2A and A3 receptors, adenosine transporter and adenosine deaminase. ABT702 is orally active to reduce pain and inflammation in animal models, yet found to be clastogenic in an in vitro Chinese Hamster micronucleus assay.The first, non-nucleoside adenosine kinase (ADK) inhibitor (IC50 value 2 nM and 50 nM in cytosolic and intact cell assays, respectively). 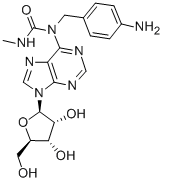 SCH 442416 acts as an Adenosine A2A-R antagonist displaying high selectivity and affinity. A2AR-agonist-1 is a potent A2AR and ENT1 agonist with Ki of 4.39 and 3.47 for A2AR and ENT1. AB-MECA is a high affinity A3 adenosine receptor agonist, has high affinity for recombinant A1 and A3 receptors. 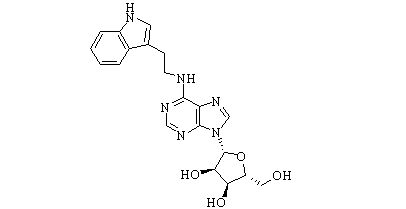 N-[(4-Aminophenyl)methyl]adenosine is a adenosine receptor inhibitor, with Ki of 29 nM for Rat ecto-5′-Nucleotidase. LUF6000 is an allosteric modulator of the human A3 adenosine receptor (AR).